Struggling with email archiving, Kester & Partners Accountancy needed a robust solution for storage and compliance. Enter Exclaimer Mail Archiver. Employees were archiving emails using easily corruptible PST files, which was problematic from a legal perspective, which could not be stored on the organization’s Exchange server. 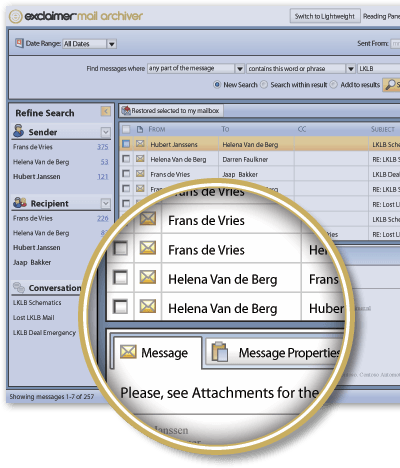 By choosing Mail Archiver, Kester & Partners achieved dramatic productivity savings through having the use of a central email archive store that gave users easy access to their email history. Based in the Westland region of the Netherlands and with its founding roots in the horticultural industry, Kester & Partners Accountancy works with a large number of medium and large enterprise companies. Dutch organizations of a certain size are required by law to do an annual financial audit through a firm that has a license provided under the Audit Firms Supervision Act (Wet toezicht accountantsorganisaties), which is one of the main services that Kester & Partners provides to its clients. With over 60 members of staff, each with different skills and specialities, Kester & Partners prides itself on providing clients with a personal and pragmatic service that goes beyond working on financial statements and tax returns. As a result, the organization has grown to provide additional services such as payroll administration, business advice and future funding opportunities. As is typical of many organizations, employees of Kester & Partners send out thousands of emails per day. Employees would never wish to delete any emails in case they needed to refer to them in the future, so mailbox limits had to be enforced by the IT department to stop the Exchange stores getting too large and unmanageable. Therefore, it had become common practise for employees to archive all emails to local PST files so as to avoid any Exchange performance degradation. However, PST files have a reputation for becoming easily corrupted, especially if a file grows beyond its natural limit. This was a regular occurrence at Kester & Partners, requiring the IT department to continuously conduct time-consuming repairs. This would incur a cost due to the administrative effort required to perform such a task and there was always a danger of inadvertent data loss. In addition, as an accounting firm, the organization has a legal responsibility to store all emails for regulatory compliance. By using PST files, staff could possibly delete important emails and the search functionality was simply not fit for purpose, putting the organization at risk if any legal action was to occur. This was all the more reason to find an alternative and more effective method of archiving. As Mail Archiver did not require the use of SQL server software, we achieved substantial cost and license savings. In these times of budget cuts, this was a big plus. Tasked by management to look for the answer to these issues, Jan Pronk, System Adminstrator at Kester & Partners, immediately began researching archiving solutions from a variety of different vendors. “None of the products I found were exactly what we were looking for and I was frankly shocked at how expensive they all seemed to be,” stated Mr Pronk, who though he would have to purchase either dedicated hardware or a cloud based solution that would involve a SQL server installation. Exclaimer Mail Archiver provides all the benefits of email archiving within a simple and low-cost solution, which can be easily scaled to meet the needs of any organization. The software allowed Mr Pronk to easily batch-import all the organizations’ PST files into one central archive store, safe in the knowledge that it had the same protection measures used by Exchange databases, ensuring security and compliance. No longer requiring unreliable PST files, archived emails no longer needed to reside on any workstation hard drives, which could have led to catastrophic data loss in the past. Mail Archiver has provided Kester & Partners with a powerful solution that requires no database maintenance and no need for expensive third party alternatives. If any email evidence is required in the future, relevant communications can be found quickly and users can safely retrieve old emails whenever they need to.